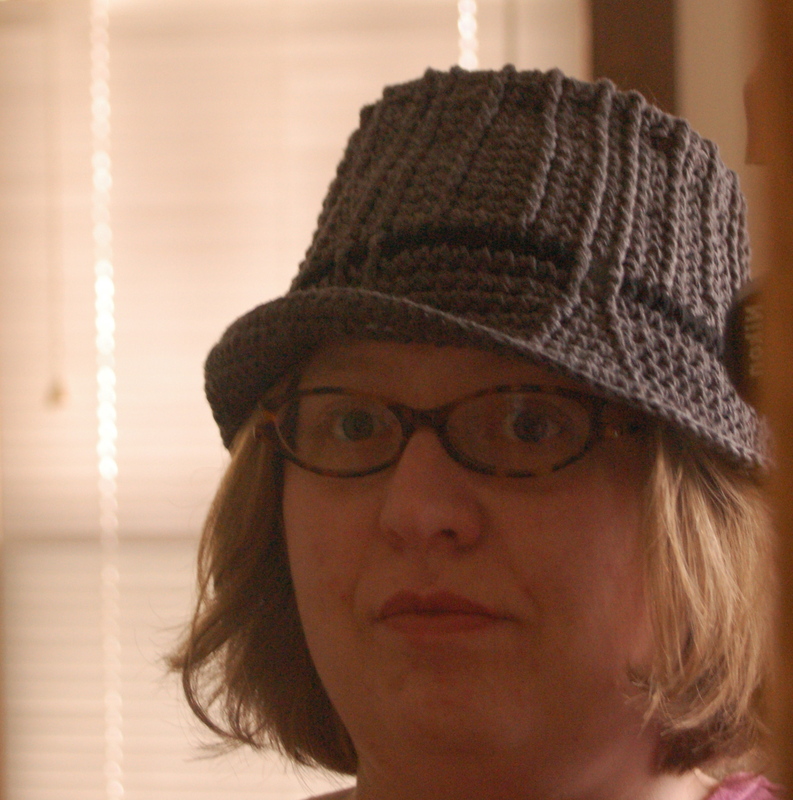 This entry was posted in Uncategorized and tagged crochet, fiber arts, hat. Bookmark the permalink. So cute! Is the pattern available online? Thanks, Hannah – that site could become very addictive, I think! What a fabulous hat! It looks great on you. I haven’t tried entrelac yet — I find it intriguing, but I’m not sure how often I would use it. There are some new pattern books out for entrelac though which are getting good reviews. I love that hat! The ribbed-ish texture and design of the brim are fantastic. The brim makes that hat. Nice job! Whoa, I love the hat!!!!!!! Did you have to reinforce it at the top? It looks perfect. Tami, the pattern calls for crocheting over weed-whacker nylon cord in one round at the corner of the top (does that make sense?) and in the brim. Thanks! Cute fedora! I checked out your Rav link, it looks cute on both you and your Dad. That is a really cute hat and I love that it’s using recycled yarn. Now I want one like that. I really love using recycled yarn when I can! Cool hat! I really like the color. The hat looks terrific on you! I love how you used recycled yarn for it. The Motley pattern looks so cool. I’ve never tried entrelac before but I love how colorful the results are. I love this hat. With my cold afternoon ahead, I may just have to find a pattern like this for myself. Awesome!! Oh, I love its shape and the color! I wish I could crochet too, but no matter how hard I try, I always end up with a bunch of knots that would give a sailor a headache! I’m a hat person and I LOVE this hat! Very impressive! Hee, thanks! It’s pretty different from most crocheted hats I’ve seen (or made).